Yes, that is a swimming pool in the dining room. Although this set-up could provide for some very interesting dinner parties, it’s the playful light fixture arrangement and the modern vintage chairs that caught my eye. You could totally recreate this look on a budget using your traditional dining room table. 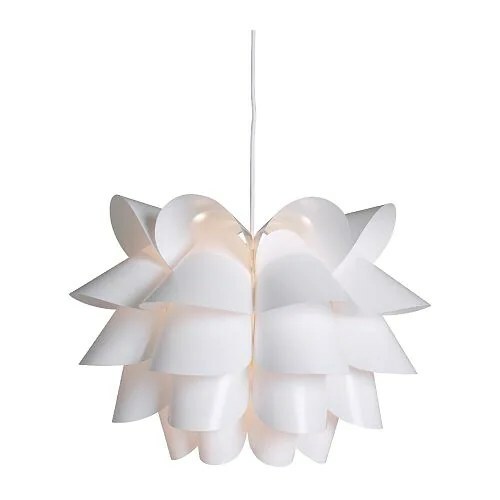 For lighting, purchase a few affordable Ikea ceiling fixtures and throw in a couple battery-operated pretty paper lanterns, all hung at varying heights over the dining room table. And you are in business. The floating white lights would look amazing against a saturated wall color like a peacock blue or an emerald green. Add your traditional dining room table (which no one will even notice because of the cool lighting and unexpected chairs), and you got yourself a gorgeous dining room on the cheap! Oh, and throw in a pool too, if you are so inclined….